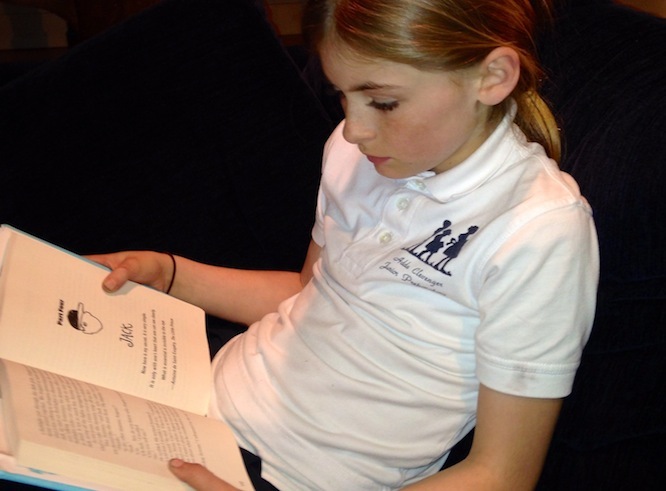 Our special guest writer of the day is Ryan, a 4th grader who lives with her Mom and Dad in San Francisco, CA. She occasionally writes on her mom’s blog Little Pickle Press. She enjoys playing soccer, hanging out with her friends, and loves to sing and dance. Photo caption: Caught in the act! Ryan reading her book Wonder. Photo Credit: Rana DiOrio. 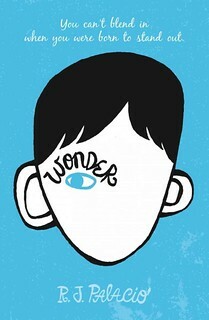 Wonder is a book about a boy named August who has never been to school before starting in the 5th grade. August was born with a genetic facial disorder. His eyes were positioned one inch below normal. When he was born, he didn’t really have a chin, so one of his many surgeries was to take some of his hip bone and put it in the normal chin area. The reason he couldn’t go to school before the 5th grade was because he was often recovering from surgery, and his mother wanted to protect him from the world. This book taught me so many important lessons. Most importantly, accepting people for who they are, instead of how they look, can make life so much better for everyone. Put yourself in their shoes. Imagine how it would feel to be them. Would you like everybody to stare and point? Or to be friendly and kind? A little kindness goes a long way. When you are kind to someone, you can make that person’s day. Another lesson Wonder taught me is to be brave. If someone brings you down, do something about it. Tell them to stop. Don’t be afraid to stand up for yourself. I think people bully because they have been bullied themselves and want others to feel their pain. August started school with two new friends . . . and lots of bullies. As he showed people that he wasn’t a “freak” or a “zombie”, more and more people wanted to be his friend. At the end of the book, August achieved two of his dreams. First, he started his summer break with loads of friends. And second, he got a standing ovation. I wish that we could all be kind and accept each other just the way we are. There would be no bullying or taunting, no intolerance or ignorance. Instead, there would be more compassion and empathy, more smiles and laughter. The world would be a better place. I loved Wonder and recommend it highly for readers of all ages. March is National Reading Month! Tell us what books inspire you in the comments below.